1 Views of Israel and the Palestinians have become more ideologically polarized. In early September 2001, just before the 9/11 terrorist attacks, there were only modest partisan and ideological differences in Israeli-Palestinian sympathies. 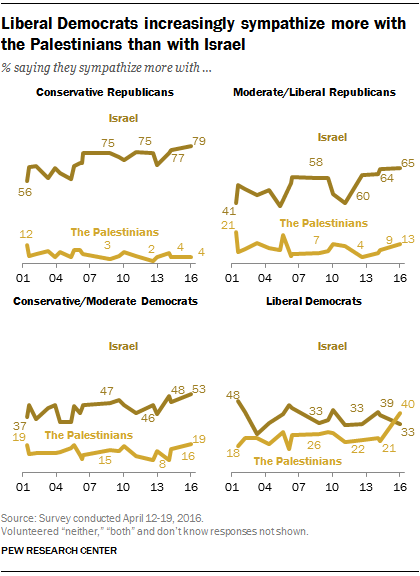 But since then, and especially over the past decade, the share sympathizing more with Israel than with the Palestinians has increased among all ideological groups, with the exception of liberal Democrats. 2 Religious groups also differ in Mideast sympathies. Nearly eight-in-ten white evangelical Protestants (79%) sympathize more with Israel, while just 5% sympathize more with the Palestinians. Opinion is less one-sided among white mainline Protestants and white Catholics; still, 60% in both groups are more sympathetic with Israel, while just 14% in each group side more with the Palestinians. 4 There is a growing generation gap in Mideast sympathies. A decade ago, Millennials and older generations held similar views on the Israel-Palestinian dispute. But today, Millennials are less likely than older Americans to sympathize more with Israel, and more likely to sympathize more with the Palestinians. 5 Americans are somewhat more optimistic that Israel can “coexist peacefully” with an independent Palestinian state. 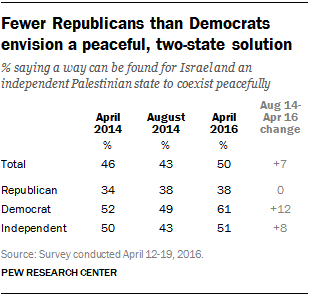 More Americans (50%) say that there is a way for Israel and an independent Palestinian state to coexist peacefully than say that there is not (42%). Optimism about a peaceful, two-state solution is somewhat greater today than in August 2014 (43%), shortly after the end of weeks of hostilities between Israel and Hamas.